With a large number of international schools thriving on the fringes of the city, Bangalore could well emerge as the school destination not only for those who are looking for a global flavour in schooling but also for many across the globe aspiring for quality education. These schools not only take pride in their world class infrastructure, they actually give competition to legacy schools like Sophia, Baldwin, Bishop Cotton, and Cathedral. International Schools such as The International School Bangalore (TISB), Treamis World School, Ryan International School are usually spread over 2 to 7 acres of land. “Schools are coming up on the outskirts for the simple reason that there is land available only there. If one wants to provide a school with world class facilities, you need lung space which is available only if you venture out of the city a bit,” says Indrani Sudarshan, Director, Academics, Ebenezer International School. Yet another factor that has fuelled the growth of schools in these areas is the population explosion in these parts. With the city growing in leaps and bounds, many are buying houses and settling down in areas like Hebbal, Bannerghatta, Bommasandra. In consequence, schools opening in areas like Yelahanka, off Sarjapur road, Hosur road, Electronics city and off Bannerghatta road are in great demand. For residents of these areas, sending children to the newer schools here seems to be a better option than having them travel all the way to one in the heart of the city, braving Bangalore’s infamous traffic. “The IT industry has grown on the southern, western and now northern corners of the city. This section has high disposable income, is well-travelled and global in outlook. International schools provide for internationally recognized and accepted IB and IGSE curricula, to which the kids of expatriates can adapt easily,” says Prabhu Jahagirdar, educationist and founder of Pupil Tree Foundation, which runs a chain of educational institutions across Karnataka including preparatory schools, daycare centers and schools up to the pre-university level. “The objective of the curriculum is to prepare children for international universities and colleges and the teaching and learning methodology is based on international best practices, exposure to a multicultural environment, technology integration and real world learning environment,” adds Prabhu. International schools on the outskirts of the city appear different from the traditional ones in several ways. They started with fresh philosophies and concepts, which young parents welcome. “Some schools have buildings constructed exclusively for art and design, carpentry, music and theatre and photography. Innovative thinking has led to creativity. The traditional schools continue to follow what has been passed on to them. Some do adapt to the changing world but by and large, tradition overshadows new adaptations,” says Indrani. A survey conducted last year by ThinkVidya.com, an online portal for parents rated Stonehill International School in Bangalore North as the best International school in Bangalore, with a rating of 4.3 on a scale of 5. This was followed by The International School of Bangalore, rated 4.09 and thereafter by Trio World School and Jain International School jointly at number 3, both with a rating of 4.07. The report looked at infrastructure and facilities, safety and security, quality of education, overall child development, value for money, overall satisfaction and brand recognition. Encouragingly, most of the international schools seem to have lived up to the expectations of parents. The fee structure of these schools, however, is high – often running into lakhs making it impossible for many to afford. That is where schools at the next rung, like Delhi Public School, Prakriya Green Wisdom school, Poorna, Sri Kumaran come in. These schools located on the outskirts do not follow international curriculum. But some of these follow alternative systems that do not follow the standard examination-oriented pattern of education. These schools have comparatively smaller fee structure, but still offer good infrastructure. For example, according to a survey by EducationWorld India in collaboration with market research company C fore, The Valley school, off Kanakpura road, has been among the top ten schools in the country for two consecutive years. In many cases, kids come all the way from the city too to attend these schools. Some schools like Ebenezer International even offer a weekly boarding system, wherein the children stay in the school campus during the week and visit parents during weekends. Along with infrastructure and exposure to various extra-curricular activities, these schools believe in smaller numbers per class that appeal to many. “Through individual attention, the total personality of a child is nurtured and groomed. Today, in most homes both parents work. The next best home for children is school. With smaller numbers and a wide range of subjects to choose from, a child can pursue his or her dream,” says Indrani. But with all these, has the popular vote tilted away from legacy schools to these? Not quite as the charm of older, reputed schools persists. They have their own rich history, culture, alumni and cater to a middle to lower-middle class clientele. These schools are centrally located, follow either the ICSE or CBSE curriculum, and have well-developed, even if not spectacular, infrastructure. “The charm still exists for these schools because many new middle class parents like us want their children to have a piece of the famed legacy and the prestige of studying in these schools. But somehow my son couldn’t get admission,” says Surabhi (name changed), mother of a 12-year-old boy studying in one of the international schools. D P N Prasad, an educationist and Director, Core K12 Schools Pvt Ltd, who has visited and researched many schools in the city, gives his vote to traditional schools. “There is still plenty of demand for old schools. Most of the international schools are a failure. They lack clientele, good sports facility and other essentials. Many a time, distance is a problem. How far can the buses go? I feel these schools are still struggling to pick up,” he says. He also narrates an incident wherein he saw snakes roaming around in one of the international schools located in the outskirts. “The school was almost in the forest. It was that far! And, school authorities couldn’t do anything about it. So, the safety of students was in question,” he says. Irrespective of whether legacy schools are better or international schools, Bangalore seems to attract a large number of people across the globe, including students from the Middle East and Africa, looking for quality education. With good climatic conditions, broad outlook, variety in the field of education, it also attracts a lot of international students from non English speaking countries for learning English. According to Nitin Pandey, education expert and founder of parentune.com, an online portal to help parents discuss child related issues, the most popular schools in the city comprise both international an d traditional schools. His list of best schools include Bishop Cottons, St.Joseph’s, Indian Public School, Global Indian International School, Mallya Aditi International School, National Public School, Indus International School and Inventure Academy. “All schools may do well if they create a solid infrastructure and still manage to be in close proximity from the residential catchments,” sums up Pandey. “It is said that schools should be in places where children feel comfortable and enjoy going to. Old schools cater to the above need in their own unique way and new schools put in all efforts to ensure that a child gets a wholesome and unique experience in school. It does not matter whether the school is new or traditional, it becomes successful if it provides this unique experience to its students and takes care of holistic development of the child,” says Geeta. Conversion takes place without consent, in Bengaluru’s voter list! If you want to vote in the Bengaluru municipality elections, do check your name on the voter roll. On the other hand, you might have erased someone else’s record on voter list, while modifying yours. Not your mistake, anyway! 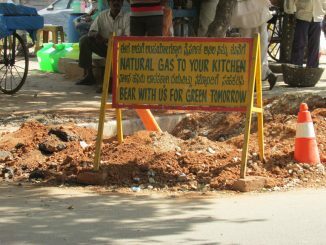 GAIL piped gas supply: When will it reach your home? Piped gas supply is expected to reduce cost, and is safer than LPG. When will it be available for homes, hotels and vehicles? An in depth look at GAIL’s plans for Bengaluru. If you are looking for International Schools in Bangalore, Then Candor International School is Best Choice. Good Schools Near BTM, Schools Around KR Puram.